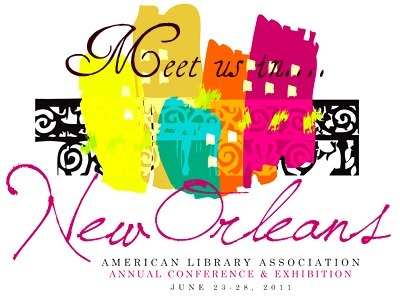 I Read Banned Books: ALA - New Orleans Bound! ALA - New Orleans Bound! 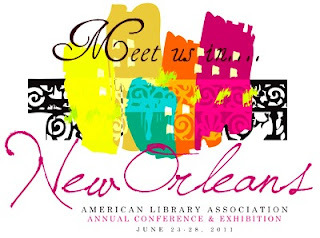 In just TWO DAYS I will be heading to NoLA for ALA. It's like the mother ship calling me home! If you can't tell....I'm excited! I am a bit nervous, I will be presenting a paper this year. 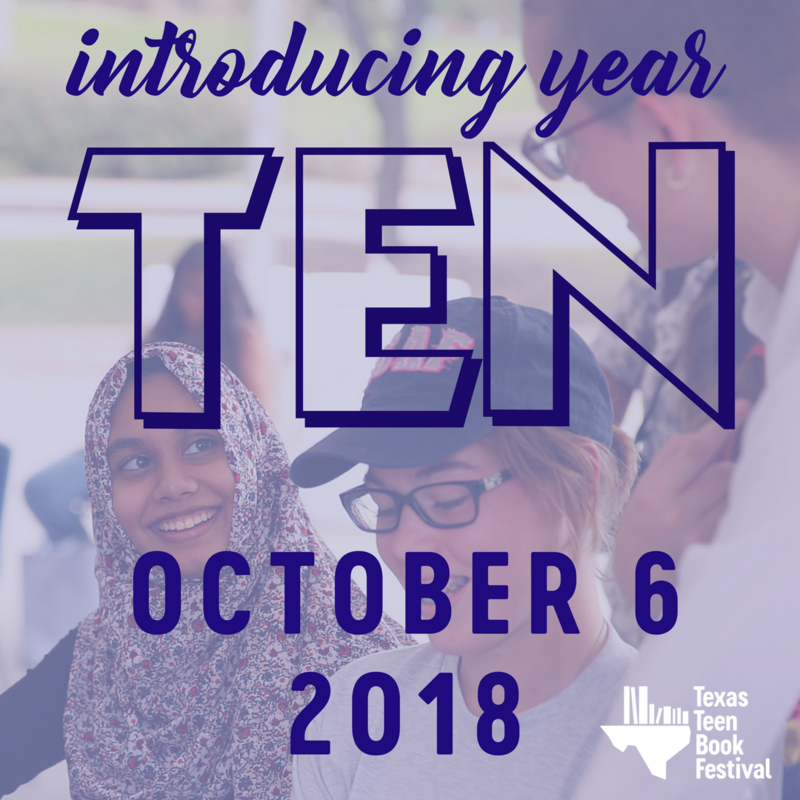 The panel is called: "Learning from Elmo, Blue and Dora: Applying the Science of Children’s Educational Television to Storytime" and we will be discussing just that - the science of Ed TV and how you can apply that to your storytime. It's fascinating stuff! 1. Wear comfy shoes, fashion is almost out of the window. Almost - keep the Crocs at home unless you over the age of 55. 2. Do not take bags with wheels! It is so not fun to trip over these walking the floor and plus you look silly if you under the age of 55. Most places have a bag check or post office for you to check in or ship books. 3. Do not cut in line unless you ask the immediate people behind you to save a space while you exit for emergencies. Emergencies would be restroom issues, not book issues. If you don't follow this tip, be prepared to have your name blasted on Twitter. Just saying. 4. Keep the trash talking to an all-time low. You never know who knows who and who could be listening! Plus, you look like a spoiled brat face when you can't keep your trap shut. Wait to unload on your hotel roommates or do like the Oprah do, journal it! 5. Bring business cards and get ready to smile! Introduce yourself to everyone and anyone. You know, it's like Six Degrees of J.K. Rowling. Hand out your cards and follow up on the Twitter follows and emails. 6. Bring mints and leave your gum at home. No one likes to watch you chew for hours on end. 7. Bring CASH! Just when you think you have enough cash, bring more. Cab rides, snacks, books..it all adds up. 8. Bring your camera and a phone charger. With Effbook and Twitter, phone batteries run down fast. Bring your charger and find an outlet if you can. I have charged my phone in all sorts of unique places. 9. If you don't want a book or don't need a book, leave it for someone who does. I always need to remind myself of this one.... In a sense, leave your greedy hands at home. 10. ALWAYS say please, thank you, and excuse me. So, there you have it, my tips on ALA. There are several parties and meet-ups and I hope to meet you all somewhere, somehow! I have a super fun event Friday night and every time I think about it, I want to tear up so I am out of commission that night. More on that later...Saturday, Parajunkee and gals are hosting a get together at Acrme Oyster House at 5:30pm and YA Highway is hosting at Tommy's Wine Bar at 8:00pm. I plan on being at both for a bit so please say hello! Details of the two events are below. I will be truckin' it down with my literary PIC Stephanie and Michelle to Houston this Wednesday to pick up Cari and attend the Ally Carter event at Blue Willow. Then Wednesday, we are NoLA bound! 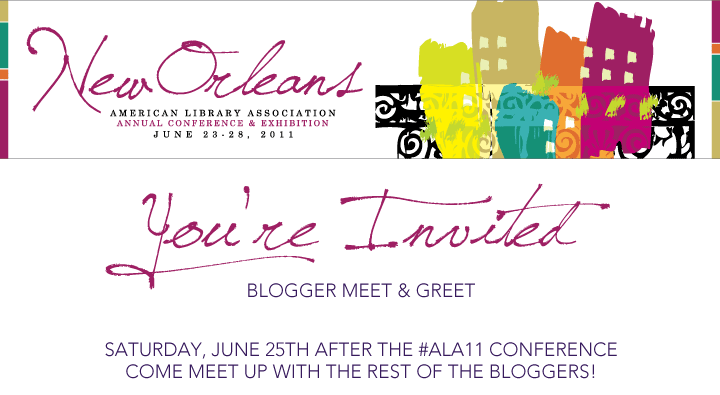 The bloggers that are attending ALA 2011 will be meeting up after the Saturday, the 25th conference. Everyone is welcome to join, we just need a head count. If you are joining us you are more than welcome to post this on your own blog. I know we all have different followers depending on genre and friends. It would fun to meet as many as possible and maybe take over Acme. Everyone travel safe and make the most our of your experience!